The 18m/60’ter in Melbourne Australia is quite unique. It is the first infused flat panel harry built and the first harry built without Rob’s direct input. In many ways, it was the inspiration to have a closer look at the KSS build method. The owner, who had previously owned power boats, bought a set of Visionarry cruiser plans and used them as the basis for his boat, which he build pretty much single handed, including the rig. 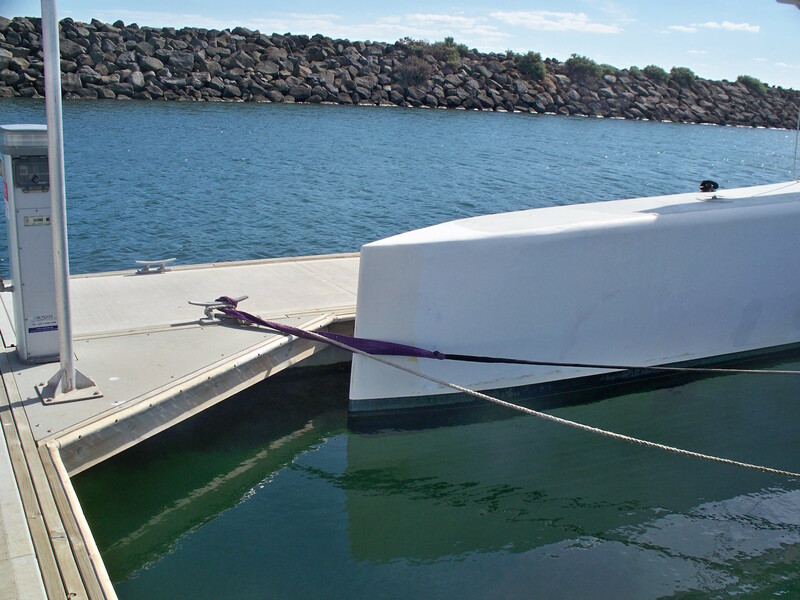 Rick Willoughby – The bows on the lw hull are now almost plumb with much finer entry at the deck. At 15kts the attached flow does not go higher than the deck now. The helm has been relocated to the cockpit rather than off the side of the lw hull. This change makes steering considerably more intuitive. Each wheel is fitted with an orbital pump/motor operating in closed loop with the same size orbital pump/motor at the rudder gearbox. The 1:3.3 gearbox was retained to ensure the hydraulic pressure is low. The orbital pump/motor has the torque rating to be directly connected to the rudder but the operating pressure would be higher and that would increase bypass and require high pressure fittings and pipes. The whole system as installed required around AUD1100 in parts and materials. Removing one of the gearboxes has made the steering much more direct and is now a tad heavy for the small diameter wheels. With hindsight it would have been better to use lower displacement pump/motor on the wheels to give about 1:6 overall rather than the previous 1:10. We were contemplating providing automatic make-up in the hydraulic circuits using an air over oil accumulator with a feed in check valve and pressure relief to cater for thermal expansion and leakage in the circuits but the simple closed loops are working fine and orbital pump/motors are getting smoother with more use. Both circuits are leak free at this stage. 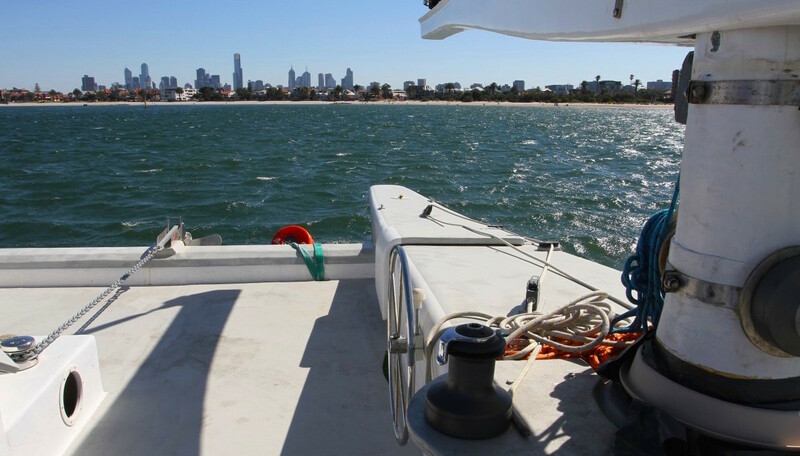 Rick Willoughby – We sailed Peter’s boat from Port Phillip to Western Port on Thursday. We had a good northerly until we got up into Western Port then the wind died. It came back up to about 8kts, allowing us to work up to Hastings. Peter plans to slip the boat in a yard at the top end of Western Port. That will happen sometime in the next week. The wind started out around 15kts but built quickly to 20kts and gusted to 25 knots at times with us running almost dead square. Downwind we averaged better than 10kts once we got going and nudged over 13kts in the gusts. Reaching across from the rip to Cape Schank gave the best speed I have seen on the boat. The wind during this period was 18 to 20kts. We touched over 17kts a couple of times. Wind was just aft of beam. We may have coaxed a little more speed if the course was 10 degrees higher. Waves hitting under the cockpit knocked the speed. The highest waves were no more than 1m because we were only a couple of mile off the shore with wind from the north. The best speed, consistently above 15kts, was as we approached Cape Schank where the fetch was reduced and waves less than 1m. We then hardened up a bit and speed dropped to around 13kts. After that the wind dropped as we got further into Western Port. I was surprised by the difference in wind speed as we got into Western Port because it was like that most of the day according to the various weather reports – only 20 mile apart but totally different conditions. The modified bow does not lift the water as much as the full flat face so not quite as spectacular looking but probably less drag associated with it. We managed a short shunt pinching up to make the channel past Cowes where the angle between tacks was 79 degrees. However that was very much tide assisted. The usual loop at the shunt looks like a smooth U-turn. 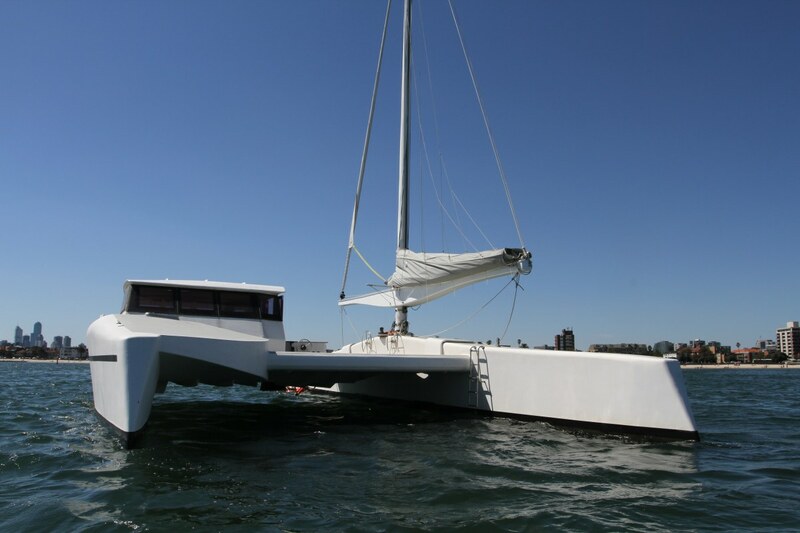 Rick Willoughby – We tested a swing-up dagger board on Peter’s boat today. Winds were very light 3 to 4 knots according to Fawkner beacon data. Irrespective of the light winds we could maintain control right up to about 45 degrees true. In these conditions we made best VMG by dropping off the wind a little but were sailing higher than nearby deep keeler. The board is fitted through a slot that has been cut in the deck. It has a 25mm pivot pin on one and and an 8mm shear pin in the other. There is a 60mm diameter stainless brace up to the longitudinal beam The board is 80mm thick, 500 chord and immersion just under 2m. It is cambered. The long slot is to cater for a collision situation when the shear pin fails by theta end of the board being forced upward. The hull is near clean at the moment. It is 3 weeks since it was on the hard for some work so fouling is light. At present we can get over 8kts with the electric motors meaning it is about as smooth as it has been since the electric drives went on. On a reach with the board up we managed boat speed above windspeed. That was coming back in 5 to 6knots of wind doing 6.5 to 7 knots through the water. The combination of relatively small but very solid rudders under the hull combined with a swinging dagger board looks good. The owner/builder is no Russ Brown. He knew nothing about infusing,flat panel building or sailing before he started, but has a wonderful capacity to have a go and try stuff. To put together a 60’ter,including building the mast, boom and rudders yourself is an amazingfeat. To build a boat using a new technique (infused flat panels)and to experiment on a 60’ter takes a huge amount of perserverence. With all this, he is extremely relaxed, quick to own any errors andan all round pleasure to sail with. He also makes a great cup oftea. The boat is not finished, but the bits that are (the galley area), areto a high standard. Like my boats, the rest of it is workmanlikerather than show room. The time, money and weight savings from thisapproach are appreciable. It is a big, undercanvassed cruiser and this was only the third timeit had been sailing. The first impression is how large it is. I am no Beken. The photos don’t give any sense of how large, airy and spacious the boat is. 7of us on board could walk round the bridgedeck easily and safely. Plus the ww hull deck. Equally easily, we could have sat around inthe saloon. The galley has lots of space, there are 2 double queen bunks and a toilet in each end of the ww hull. Low cost: Very. It is built from infused Polycore honeycomb flatpanels with curved hull bottoms. 4 tons weight including the rig and motor (according to the launch crane), with minimalist layout. The basic boat seems very stiff and strong (no big waves, but no creaks or groans), although a few fittings are too light, but this is easily fixed. There is probably another couple of hundred kgs of fitout (table, fridge, etc) to add. 7 people was a good load, but it made no trim difference where anyone stood. Easy to build: Simple shapes, flat panels, with very few deck fittings. The lee hull is 3m/10′ longer and a little narrower than the Vis and the ww hull a little longer with fewer curves than the Viscruiser (Rare Bird). The only slightly complex area is the motor arrangement which has an electric lift for the 60 hp motor. The well can’t be closed off underneath so waves hit it and leak onto the bridgedeck. There are plans for electric motors and/or two smaller outboards. Under motor the boat steers well and picking up the mooring was easy with 2 rudders and a steerable motor, aided by the picker uppers being within easy earshot of the helm. Easy to sail: It will be, once the systems are sorted out. The rudders steer well, the connection and the wheels are ok once you know them, but took me a while to learn (others were quicker) and at night in an emergency would need a clear head. 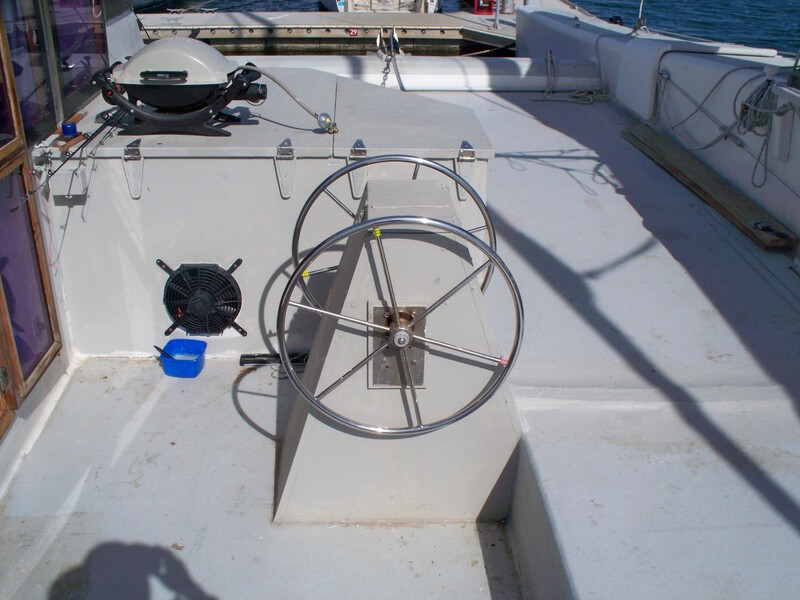 The system uses independant wheels mounted on the lee hull either side of the mast and 2 right angle gearboxes. There is a little play in the boxes and the rudders are only just balanced so there is occasional slop. Steering upwind with the front rudder worked a treat. The aft rudder was set to give a little lee helm. This had the effect of eliminating leeway,which was very obvious when looking at the wake whensailing upwind. Occasionally there would be negative leeway, with no obvious loss of speed, which is something I have tried but not achieved on other harys. My photos don’t do this justice, but itwas quite noticable. Sailing hands off was no problem. The near enough 2 ton of windwardhull and 8m beam did not have significant weather helm once the boat was sailing, but in light air is a problem. Shunting was slow (maybe a minute from dump sheet to back on course when it went well), but once the systems are sorted out it should be a quick single handed operation, the same as on the other boats with ballestron rigs. The underhung rudders are about 2m (11%) from the ends and judging by how well they steered, could have been a lot further inboard. They are not liftable, but making them so is on the to do list. Fast: The long, light hulls are very easily driven. The bows are over half a metre/20″ wide at deck level and throw up a lot of water above about 10 knots which slows the boat, albeit quite spectacularly. They are shaped foam blocks, so easily fixed. The below the waterlineshape is pretty good, judging by the wake. Top speed was 14 knots in 18 knots of wind. Best was 13 knots in 14 knots of breeze. The sails are not right, nor are the systems to trim them. Both are easily fived. The unstayed mast is very stiff up to the hounds,flexes off nicely in the puffs. One of the people on board was Peter Eagles, who does the harryproa engineering. He reckoned the mast would bend about 30% (~5m) at the tip before it broke. This probably makes the boat impossibleto capsize from wind loads. The tacking angle was poor, due in large part to lack of main leech tension and hence jib luff tension (a turning block pin was on the verge of popping out, so we did not tension things as much as we could have), and jib sheet tension (no block or jammer). Despite this, upwind speed and hence vmg was impressively good, compared to the mono racers that were around at the time. approach are appreciable. It is a big, undercanvassed cruiser and this was only the third time it had been sailing. HARRYPROA, Proudly powered by WordPress.